When Mac OS X 10.5 (Leopard) was released, I upgraded my Macbook. Only a few weeks later when I came to use my printer at home did I find that I couldn’t print or scan using my network-connected Canon MP600R. All attempts to connect to the printer using the “System Preferences… > Print & Fax” setup failed. I could ping and reach the web interface of the printer, but the network drivers just couldn’t see it. I went to the Canon downloads site and downloaded all the latest drivers, MP Navigator etc and installed them. The installation of the printer driver is pretty tedious, as you have to manually remove the old drivers, reboot, install the new drivers and reboot again. And then do the same for the scanner driver. There aren’t many Mac programs these days which insist on rebooting your machine, so Canon need to sort that out. And after all that, it still didn’t work! Next step was some intensive Googling to find people with similar problems. 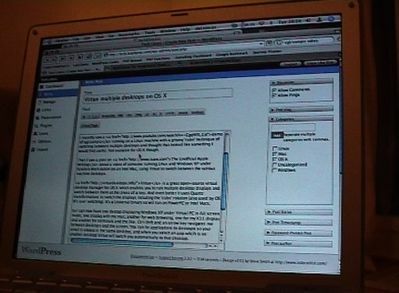 The closest I could find was a thread on the Apple Support Discussion boards about the Canon MX700. The messages suggested that the problem was the new Leopard firewall. 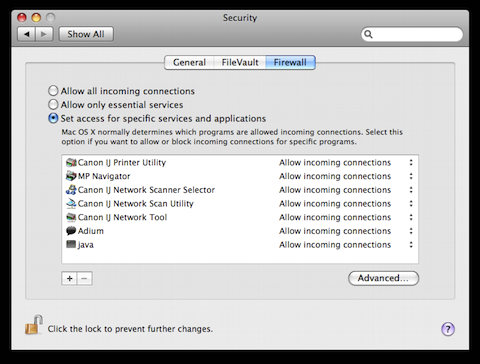 By setting the firewall to “Set access for specific services and applications” and adding the various Canon printing and scanning utilities to allow incoming connections, the networked printer could be added in the “Print and Fax” settings. 552 days, 14 hrs and 55 min.